ISO 7001 ("public information symbols") is a standard published by the International Organization for Standardization that defines a set of pictograms and symbols for public information. The latest version, ISO 7001:2007, was published in November 2007. The set is the result of extensive testing in several countries and different cultures and have met the criteria for comprehensibility set up by the ISO. 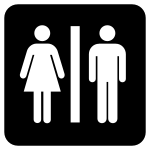 Common examples of public information symbols include those representing toilets, car parking, and information, and the International Symbol of Access. DOT pictograms - United States version of this standard. ISO 7010 - ISO Standard for safety symbols. Wikimedia Commons has media related to ISO 7001 icons.